This Sunday in worship our Gospel lesson is Luke 11:1-13. In my message, I will be focusing chiefly on this rather strange parable of Jesus. However, this is also the text where on e of Jesus' disciples says, "Lord, teach us to pray" and Jesus introduces what would become known as the Lord's Prayer. While this will not be a primary focus on Sunday, I thought I would share with you below a reflection by Christian writer Brian McClaren bringing fresh meaning to a prayer that has become so familiar that, unfortunately, it can become rote and uttered with little meaning or reflection. I hope that you will find this helpful for your own time in prayer. And who knows? It may even show up sometime in a worship service. 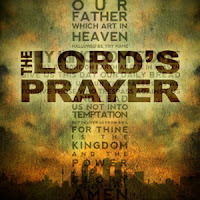 This rendering of the Lord’s prayer uses unfamiliar words and phrasing to help us actually hear its message rather than lapsing into an auto-pilot recitation. You can use it in public worship by having a leader recite a line, having the congregation echo it, and then leaving a moment of silence for reflection. May your unspeakable Name be revered. Here to earth, may your kingdom come. Here on earth, may your will be done as it is in heaven. Give us today our bread for today. And forgive us our wrongs as we forgive those who wrong us. Lead us away from the time of trial. But liberate us from the evil. And the glory is yours and yours alone. I also hope to see many of you at our midweek worship service tomorrow (Wed.) night at 7 PM.